If you need to know how to get rid of bruises, you may soon find there is no quick or easy way to heal a bruise. Although unsightly and often painful, there is no way to heal or cure a bruise in a given amount of time. 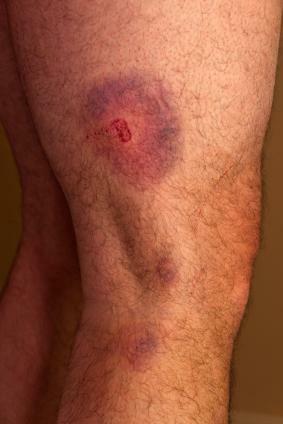 A bruise is one of the most common and non-threatening medical conditions. Anyone who has made sudden unexpected impact with another force has most likely incurred a bruise at the site of the injury. If you're wondering how to get rid of bruises or how to treat bruises at home, the best thing you can do is encourage the body's natural healing process, which requires time and a restful environment. To help your body recover from a bruise, follow these steps. Anytime an injury has occurred, the first step should always be cleansing the wound site. Take a few moments to clean the injury site with mild soapy water and pat dry. Chances are if you have a bruise, it may be accompanied by small cuts or peeled skin. If needed, follow cleansing with hydrogen peroxide and an antibacterial cream such as Neosporin. Next, get an ice pack and apply ice directly on the injury in small timed intervals. The ice will help reduce the amount of swelling while constricting the blood flow to the site, thus preventing the visible signs of a bruise. After the bruise has been cleansed and iced and a bandage has been applied, it's time to take it easy on the couch and elevate the wound site. To elevate the injury, prop the injured limb up on a pile of pillows and try to elevate it over the heart. Blood pressure is heavier below the waistline; to avoid excessive bruising on the legs, it's important to restrict some of the flow through elevation. Now is the time to catch up on your favorite book or television programs. Once your bruise has been iced and elevated, you'll need to rest as much as possible to help your body recover. For mild pain relief, administer Tylenol, Acetaminophen or Excedrin if needed. Avoid aspirin pain relief, which will only inhibit your body's ability to clot the blood. Aspirin is a blood thinner, and blood flow will increase if administered, thus increasing the size and the diameter of the bruise. There are a few topical creams on the market aimed at treating bruises. Many of these products, such as Lanosil, are designed to prevent the onset of a bruise after injury occurs. Infused with either vitamin A, vitamin K or the plant supplement Arnica, these creams or gels are said to reduce swelling and redness while promoting the body's natural healing process. Keep in mind if you seek out one of these over the counter remedies, results are not promised nor guaranteed. While most bruises will recover in due time, there are plenty of people who require medical treatment for them. Both the elderly and young children or infants should seek medical care when necessary. In addition, if a bruise does not heal within a couple of weeks or if the injury or condition worsens, or if it's accompanied by severe pain, blurred vision, vomiting or dizziness, it's time to seek medical care. Important: For infants or small children, it is always advised that you seek medical care for a head injury rather than treat at home. Many head injuries can be fatal and the symptoms may be too minimal to self diagnosis. While there are a few over the counter treatments for bruises, the best process for healing a bruise is to rest, relax, ice the area and play the waiting game while your body recovers from the unexpected blow.